Newly developed for high-powered SUVs and offroad vehicles, the Grabber GT is not just really good to look at. Its asymmetric tread design guarantees outstanding handling characteristics on dry and wet surfaces, and a high level of safety thanks to excellent braking performance in the wet. 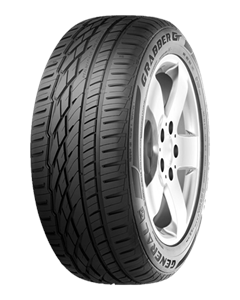 The harmonious tread structure on the newcomer provides high levels of driving comfort by significantly reducing external rolling noise. I love this place. Great service. Great price. Super friendly and knowledgeable. Always get my tyres from here but this time I tried a different thing I ordered the tires online and sent them to here and they contact me told me when they were there and I went to get the fitted to the car the whole process took an hour 4 brand new tires the guys couldn't have done it quicker and better and gave me lots of advice on how to maintain my tyres. Called up, ordered tyres and fitted the next day. Excellent service, polite friendly and efficient. Great service...very polite and professional.